Nightstick’s innovative Dual-Light™ Technology proves that two is always better than one, and the new Nightstick NSP-2422 X-Series Multi-Purpose Flashlights demonstrate how a unique design can make all the difference. 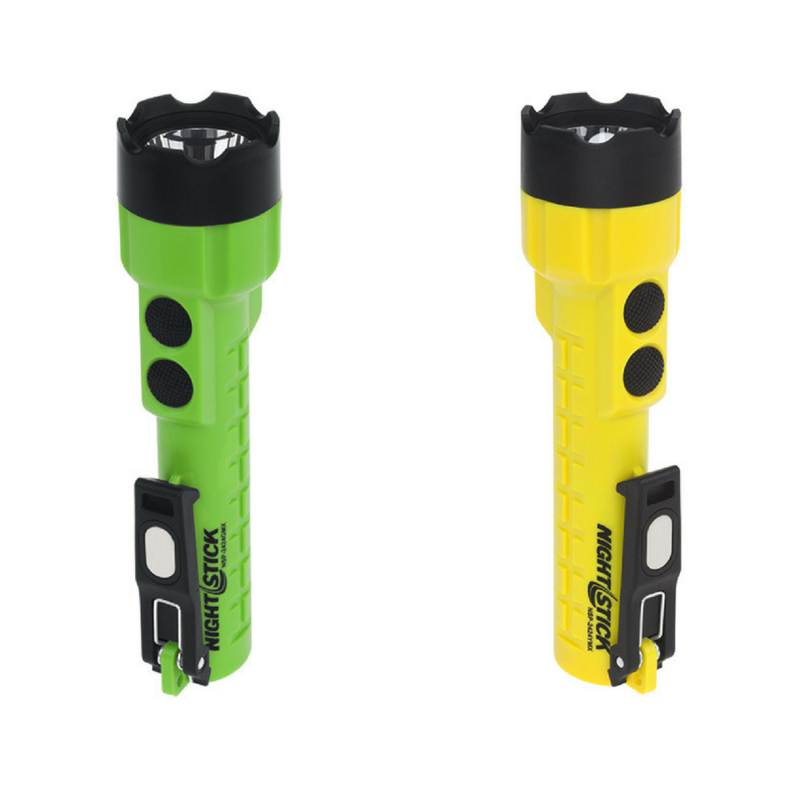 The upgraded NSP-2424GMX (green housing) and model NSP-2424YMX (yellow housing) X-Series Dual-Light Flashlights feature a significant lumen increase over previous models while keeping two independent LEDs and two integrated magnets for complete hands-free use. With the focused and crisp LED flashlight beam (now boasting 300 lumens), you’ll get superb distance illumination. The downward unfocused floodlight (now 200 lumens) is ideal for both proximity lighting on close-up tasks while also safeguarding against slips, trips and falls that went previously unseen. Activating both top-mounted independent switches in dual-light mode (now 350 lumens) maximizes your visibility and delivers convenience never seen before. Even though the lumen output is the primary focus of the 2424 series enhancement, the optimal placement of the integrated magnets stays the same with an impressive 6 hours of flashlight or floodlight run-time. One magnet is placed on the base of the housing, and the other is found on the robust built-in pocket/belt clip, providing unlimited user amenities. The NSP-2424GMX and 2424YMX feature an PC/ABS housing that is IP-X7 rated waterproof, as well as chemical and impact resistant. Included are 3 AA alkaline batteries and a removeable lanyard, all backed by a limited 1-year warranty. To learn more, please visit www.nightstick.com.